The World’s Smartest storyline comes to its climax as Moon G and Devil D calls on the many friends and allies she’s made over the adventure to triumph over an army of Doombots. From the creative team of Amy Reeder, Brendan Montclare, Natacha Bustos and Tamra Bonvillain. Amadeus Cho had used a universal metric to discover that Lunella Lafayette is the smartest being in the world. At first this was a fun validation for her, but has ultimately proven far more trouble than its worth. Doctor Doom, or rather a legion of automaton DoomBots who look and sound like Dr. Doom, has taken great exception to this proclamation of Lunella being the world’s smartest. And these robots will stop at nothing until Lunella is thoroughly defeated thus proving that Doom is actually the smartest. 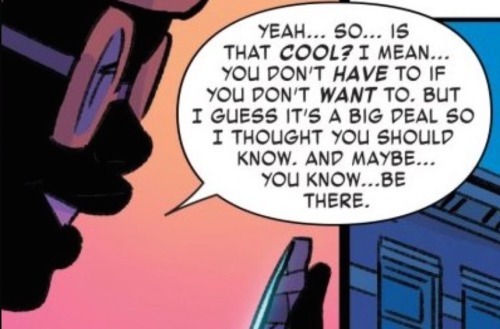 The issue begins with Lunella reaching to the various friends (and some foes) she has made of late, asking that they all be ready when the time is right. This includes Dr. 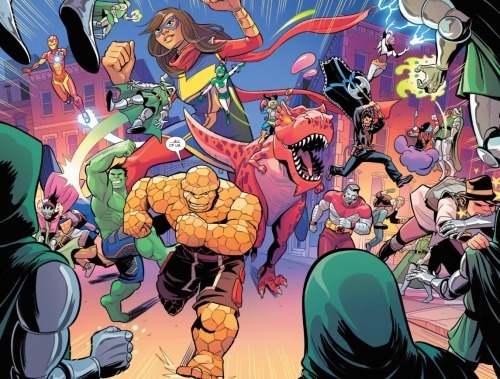 Strange, The Thing, the Totally Awesome Hulk, Kid Kree, The X-Men, Ms. Marvel, Iron Heart, and even the Yancy Street Gang! Some time later, sitting in class bored and isolated by the lack of scholastic challenge and intellectual peers, Lunella dwells over how she has come to feel overly self reliant. Doing things on her own has often been the easier way to get things done. Yet she is coming to realize that easier doesn’t always mean better. Later, in her lab, Lunella listens to the disembodied DoomBot head prattle on. She had kept the robotic head following her adventure with The X-Men, hoping too use it to foil the DoomBots’ schemes to vanquish her. Although she is starting to imagine that it is not that great of an idea to have a device in her laboratory whose sole function is to hurl insults at her… adding that she already has the internet for that (an interesting meta-contextual nod that I’ll get to later). Fortunately, Lunella has attached a restrainer device that prevents the head from signaling out to its fellow DoomBot brethren. 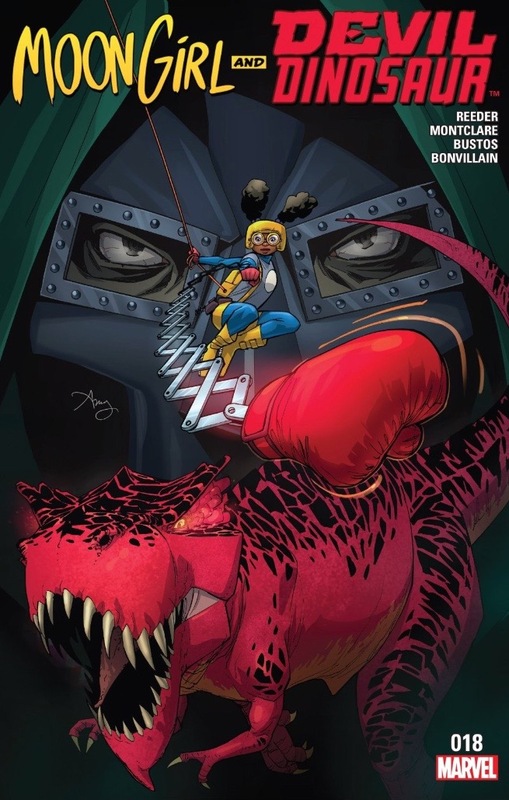 Lunella feels suddenly faint and before she knows it her Inhuman power has activated and her consciousness is switched with that of Devil Dinosaur. This ‘power’ has very often proven to be much more of an obstacle than anything else, always triggering at the most inopportune of times… finding Lunella’s mind trapped in a powerful but essentially useless dinosaur body while Devil D’s mind is sent to her body which usually entails his going on embarrassing rampages that Lunella has to try to explain later on. The hows and whys of this power has thus far seemed random, but perhaps this isn’t the case. In Devil Dinosaur’s body, Lunella gazes up the full moon and realizes there may be a correlation. It seems that their minds swap whenever there is a full moon; that somehow the lunar cycle must have an effect on her powers. If this proves to be the case it will offer Lunella a new variable that may allow greater understanding and possibly even control over her powers. A quick interlude shows Lunella’s parents preparing Thanksgiving Dinner. Lunella had promised to help her mom in the preparations and Mrs. Lafayette is rather disappointed that her daughter has once again failed to follow through. Lunella’s mom and dad have not really been a strong presence in the series thus far, but perhaps that will change in subsequent issues. The two seem to be rather exasperated by their daughter. With all of Lunella’s intellect and her exploits as Moon Girl her mom and dad seem to feel somewhat left behind and unsure what to do about it. Back at the lab, Devil D has occupied Lunella’s body and used the opportunity to wail on the disembodied DoomBot head. With the body of a nine year old, Devil D isn’t able to do much in the way of damage to the robotic head, but he does however manage to break the inhibitor module preventing it from calling out to its fellow DoomBots. No sooner than Lunella returns then the two switch bodies again and return to their original forms. And it is then that Lunella realizes that she is supposed to be home helping her mom. She arrives home in a huff, but before she can do anything, an alert comes over the television announces that a legion of DoomBots have congregated on the Lower East Side. Being self reliant and doing things on one’s own can sometimes be the easiest path, but not always the best one. And this is quite evident in the following splash-page in which a variable army of Moon Girl’s allies converge together and make rather short work of the DoomBots. The robots are routed, defeats and destroyed once and for all. Lunella had previously made the mistake assuming that being smart and being autonomous are one and the same. With her preciousness, it has been difficult for her to make friends and she had grown accustomed to doing things on her own. Throughout her trials fighting off these DoomBots, however, she has come to learn that she is not alone nor does she need to be. And that there are many times where the smartest move is simply to ask for help. The DoomBots make for an interesting foil for Lunella in this adventure. Although they act in legion, the DoomBots share a singular mind and the narrowness of this groupthink causes the DoomBots to be overly myopic, ultimately leading to their defeat. Lunella had to overcome her own tendency for myopathy in order to prevail; which she did, thanks in large part to her special bond with Devil Dinosaur. Two heads are indeed better than one, and ten heads better than that, when it allows for a greater breath of ideas and feelings. We are stronger together and overcoming a need for self-sufficiency is what ultimately allowed Moon Girl to win the day. A very fun story with an important and timely message at its core. It doesn’t matter how intelligent or proficient someone is, there are always challenges that can only be overcome with the aide of others. Needing help is not a weakness but rather a strength and a person’s reliance on mutuality can be just as important and necessary as their capacity for autonomy. There have been numerous psychological studies into what factors contribute to childhood resiliency (one’s ability to cope in the face of adverse circumstances). Each of these studies have found that said resilience is a product of a keen interplay between internal disposition and external experiences. Intellect can indeed be a major factor in bolstering an individual’s resilience, yet the most important variable by far appears to be the availability of one or more close interpersonal relationships. In other words, true independence can only be born of a healthy sense of dependence… we arrive at autonomy by way of mutuality. This is the crux of what Lunella learned through this adventure and it’s a message I support 100%. A couple of quick notes… I’m curious to learn more about the relationship between Lunella’s Inhuman powers and the lunar cycle. There have been several occasions where Moon Girl and Devil D have mind-swapped in the daytime so it wouldn’t make sense to liken the activation of her powers to that of say a werewolf. Perhaps it is the moon’s relative proximity to earth that activates her powers… keep in mind that The Inhuman city of Attilan was located on the moon for several years. Whatever the case, I’m looking forward to discovering more about this matter in future issue. 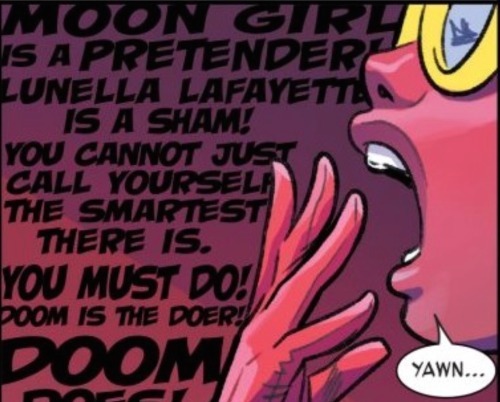 Moon Girl’s being declared the world’s smartest caused a small uproar among the fan community on the internet. There were numerous readers out there who voiced significant outrage that this relatively unknown brand new character could be just as smart if not smarter than longtime characters like Tony Stark, Hank Pam or Reed Richards. The Marvel Universe is a make-believe world where there are magic hammers, where radioactive spider bites cause super powers rather than cancer, and natural human mutation leads to the ability to control the weather. Surely a nine-year-old girl being smartest of the smart shouldn’t be all that difficult a concept to swallow. Not all but some of this outrage smacked of the taint of sexism and racism, as though the idea that the world’s smartest could be a girl and could be Black. The creative team behind the story offers a small degree of clap-back in the form of the disembodied DoomBot head and the torrent of insults it throws at Lunella. The situation between Lunella and her parents is left unresolved and I hope it gets addressed soon in future issues. It cannot be easy raising a child like Lunella and I’m feeling rather sorry for Mr. and Mrs. Lafayette. I imagine they may feel somewhat robbed of the opportunity to raise their daughter. Finally, a piece of bad news is revealed in the letters page of the issue. Co-author, Amy Reeder has announced that she will be leaving the book to focus on creator-owned projects. The rest of the creative team will stay on, with Natacha Bustos providing covers along with her stunning interior art. Fellow co-author, Brendan Montclare, will take over as sole writer and I’m sure he will do a fine job, but this in nevertheless a huge loss. I certainly understand Ms. Reeder’s wish to focus on creator-own works, indeed I would love to see Rocket Girl return to the shelves. 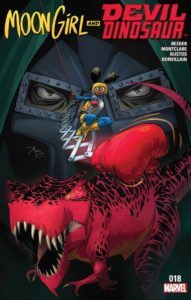 At the same time, the sense of synergy created by Reeder, Montclare, Bustos and Tamra Bonvillain has been truly exceptional, making Moon Girl and Devil Dinosaur consistently one of the best books on the stands. Reattaining such a synergy without Ms. Reeder is sure to be a difficult challenge. I think the team is up to this challenge, but it’s a bummer nonetheless. Ms. Reeder’s leaving the title is a huge loss for the Inhumans books as a whole. I wish her the best and will definitely look out for her future endeavors. 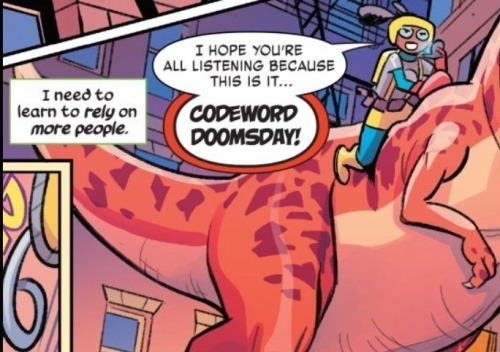 And I remain hopeful that Mr. Montclare and the rest of the team can maintain the magic that has made Moon Girl and Devil Dinosaur such a wonderful book. Definitely recommended; Four out of Five Lockjaws.